Typically I mix every two weeks and anywhere for 10-20 mixes. I have only 2 planned recpies. Mix day is this coming Saturday. Normally at this point I am forcing my self to stop building recpies. So yeah I just wanted to whine and commiserate. Rare that I do, but after three years I am at the wall and yeah. Just wanna wine. F’it mid week drinking now. No need for recpies. There are 2200 of them on the lap top. Feel free to derail in this thread, whine appropriately (meaning not to poo on anyone but voopoo lol). Happy though to see some oldies posting recently. @ozo and all the other. “@“ not pulling up names. Here are my empty bottles ready for labels. Okay, 2 things. 1) I’ve been right where you are, don’t worry this too will pass. 2) What atty do you have sitting on top of that v2? Silverplay rta for an open mtl 8mg nic salt spearmint jelly vape. Handles 30pg/70vg on a cold winters day like a champ. All the others struggle. Which is the other reason for lack of mixes because my drive home I’ve been hittting that instead of a my normal dual coil build. Mix day is this coming Saturday. Have you done all your single flavor testing? re: Why Test Single Flavors? Great, now I’m gonna have to get it out of the box and put a build in it. 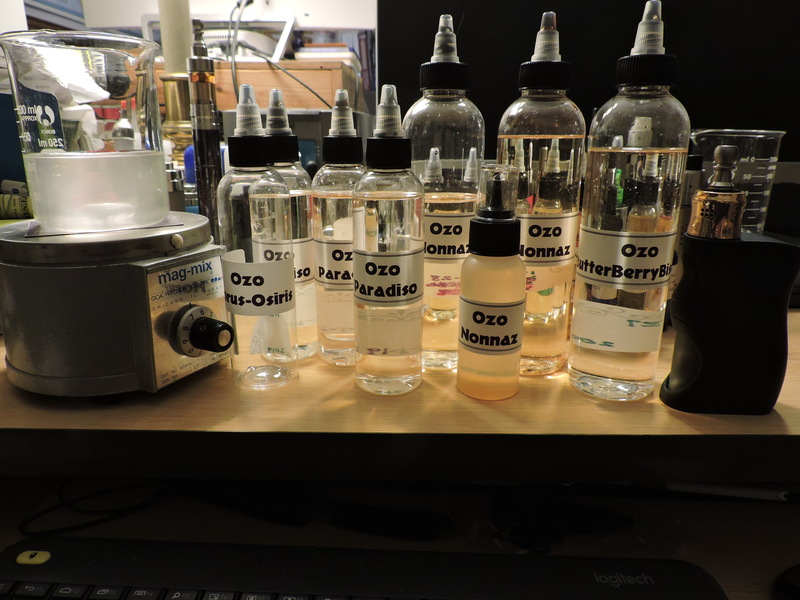 And now that I know what juice you’re vaping, may I recomend a recipe for you to mix up Sat. 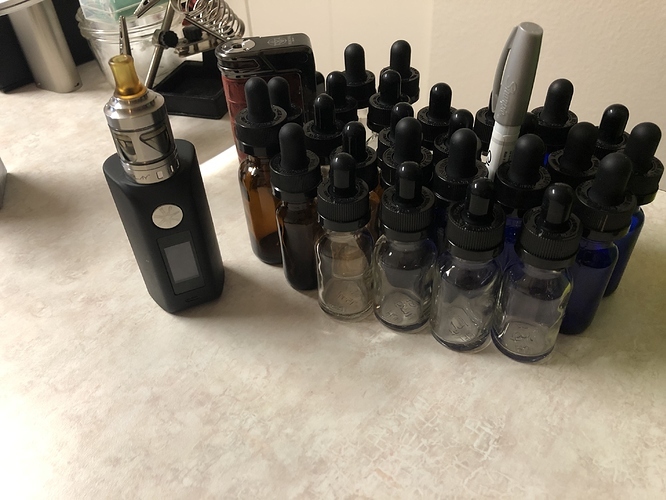 @fidalgo_vapes nothing like having 20 half full bottles of juice on your shelf and going “no I don’t want that and no I don’t want any of that” etc. Thats when I go mix up something from one of you guys. @Chrispdx here is the link to the juice I bet you’ll like. You probably wont have the ZAC gum, I’t is a mint flavored gum, I subed .25% wintergreen (FW). I think I will mix up a few tomorrow also, since you mentioned it. I would like to know How you like the silver play and I found it for 15 dollars and figured it is cheap enough to find out if I like it. I have heard different opinions on it and couldn’t make up my mind. I am so cheap and poor that even 15 dollars couldn’t make me decide. not sure if that made any sense but I don’t plan on proof reading or changing a word. There is their oringal and then a v2. But it’s not called the v2…just silverplay. I haven’t looked for changes but I would compare the version on vaper dna to eight vapes. But yeah…so far I am loving it. Just do what I’m going to do Saturday. Resident Evil 2. Got a few 4oz and 8oz bottled today. Tomorrow is another day, eh? I decided to take your word for it and get the Silverplay 24mm, looks good and will give a restricted direct lung. BTW that old silverplay v2 in the picture is a 22mm, I got it from vapordna back in 2015, and now I remember why I’m not using it. It has bottom screw that has to be removed in order to fill it. @ozo Mmmmmmmm, Buttery Berry Biscuits ?? Let me know when you get it in. I’ve like mine so far. Smaller juice capacity, but that’s fine for me. Been using a simple 26g ss316l round wire build and it works good for my drive home.